Rachel Dolezal, the head of Spokane, Washington’s NAACP chapter and an Africana studies professor at Eastern Washington University, is under investigation after her own parents publicly alleged that she has been “disguising herself” as black for many years. In interviews this week, Dolezal’s parents said their 37-year-old daughter is actually of Czech, Swedish, and German descent, with “faint traces” of Native American heritage. Earlier this year, Dolezal posted a Facebook photo of herself with an African-American man she identified as her father, but on Thursday Larry and Ruthanne Dolezal produced a Montana birth certificate and childhood photos to prove she’s their daughter. During an interview this week, KXLY4’s Jeff Humphrey confronted Dolezal about the photo, asking if her father is really African-American. 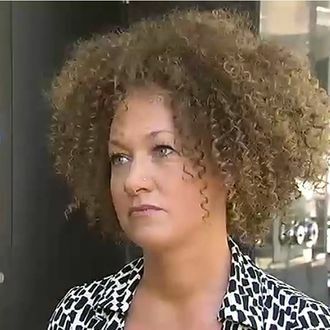 “I don’t understand the question,” Dolezal responded. “I did tell you [that man in the picture] is my dad.” Humphrey asked bluntly, “Are your parents white?” and Dolezal walked away, ending the interview. KXLY4 was interviewing her about the eight hate crimes she claims she’s been the target of in the past few years. The network could only find three police reports, and there was insufficient evidence to prosecute in each case. Some have alleged that Dolezal fabricated the incidents. Dolezal identified herself as being white, black, and American Indian on her application to the Office of Police Ombudsman Commission, and KXLY4 reports that Spokane is investigating to see if that claim violated any city policies. Ruthanne Dolezal told The Spokesman-Review that her daughter started portraying herself as black in 2006 or 2007, when the family adopted four African-American children. She accused Rachel of passing off her adopted brother Izaiah as her son, and fabricating many wild details about her upbringing, including that she was born in a tepee in Montana and had to hunt for her food with a bow and arrows.